Our Agile Certification Training Course runs all year-round in Dublin, and is suitable for all levels of experience. This 3-day course is designed for anyone who wants to gain skill and confidence with Agile methods, while also achieving an international Agile certification. Over 3 days, you’ll learn how to implement Agile successfully in any working environment. You will also begin preparing to sit the SCRUMstudy Agile Master Certified (SAMCTM) exam. Study materials, exam and certification costs are included in the course fees. By completing this course and successfully passing its exam, you will gain an internationally respected certification from SCRUMStudy, a global accreditation body for Scrum and Agile certifications. To manage your costs and keep your booking stress-free, we include all training, study, materials, exam, and certification costs in your price. We cover a full spectrum of Agile processes and practices including Kanban, Scrum, and Extreme Programming. Our delivery style of combining practical and theoretical learning will give you confidence in your ability to implement Agile within your own working environment. The course content below is an excerpt from the complete Agile Certification Training Course outline. You can read the full course outline and learn more about achieving your certification by downloading our course brochure. Agile is an iterative approach to project management. It enables you to break a project into time-divided sections and react promptly to change. Agile is used for projects with end results that are difficult to define, or where there is a high likelihood of changing requirements. Although Agile originated within the IT sector, there has been a rapid expansion into other industries in the last few years. There are a number of subsets (forms) within Agile including Crystal, Extreme Programming and Test Driven Development. However, Scrum is by far the most widely used of all the forms of Agile. 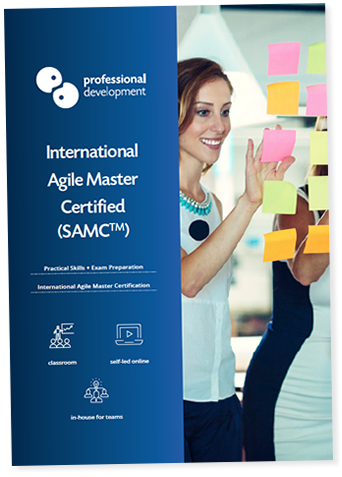 Why Agile Master Certified (SAMCTM)? The Agile Master Certified (SAMCTM) certificate is awarded by SCRUMstudy, a global accreditation body for Scrum and Agile certifications. SCRUMstudy certifications are recognised by companies worldwide including Apple, Bank of America, PepsiCo and IBM. Professional Development is a SCRUMstudy Authorised Training Partner (A.T.P.). Gaining an international certification in Agile will communicate to potential employers that you have a high level of skill and competency in Agile methodologies. This certified programme is part of a suite of accredited Agile and Scrum courses. It can be taken as a standalone course, but many participants choose to combine it with our Scrum Master Certified (SMCTM) course. We also run this Agile Certification Training Course for in-company programmes. This is an excellent way to begin introducing Agile thinking across a team, department, or your whole business. In-company training is a flexible and cost-efficient way to train your team. If you have a number of candidates for Agile training, there are many reasons why in-company training may work best. In-company training allows us to customise the course content a little so that it is relevant to the processes and projects your team work with. This style of training is high-impact. We deliver the course to your team only, enabling us to focus on their needs and optimising their learning experience. You can schedule training dates that work best for your company's calendar. We come to your location, or a venue chosen by you. 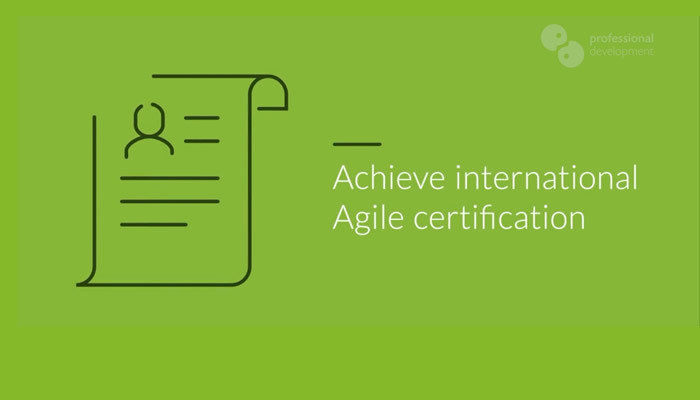 This Agile Certification Training Course includes training, class materials, online study access, exam, and certification costs. You can learn more about our in-company Agile Certified Course programmes by clicking the button below.